$1073 if it is shipped direct to you. Not all areas are available to receive this product due to its weight. Please call and we will confirm delivery in your area by UPS or similar courier with this weight. 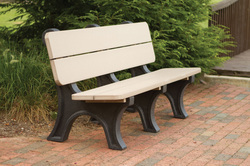 If you are in the Magnolia/Tomball/Conroe/Woodlands areas, we will happily deliver and assemble this park bench for you on your site for $1299. We have beautiful vinyl arbors. $1805 fully assembled in white, in our delivery area; shipped direct to you $1440 as a kit in white. The arbor is available in clay color for $2020 assembled, in our delivery are, or shipped direct as a kit in clay for $1720. Arbors can be purchased separately or with a two seat or three seat swing. Two seat casual back swing is $573 assembled in our delivery area, or $513 shipped direct to you in a box and you assemble it. 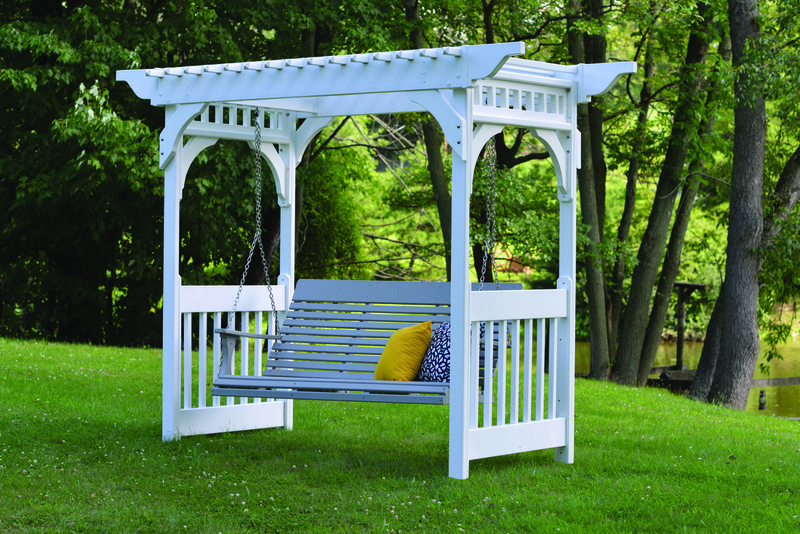 Shown above with a three seat swing in light gray with a "casual back". Three seat casual back swing is $690 assembled in our delivery area, or $624 shipped direct to you in a box and you assemble it. We have "A" frames which can be purchased with a two seat or a three seat swing. Shown above with a two seat swing with a cozi back. Vinyl A frame in white $1193 fully assembled in white, in our delivery area; shipped direct to you $943 as a kit in white. This "A" frame is available in clay color for $1306 assembled, in our delivery are, or shipped direct as a kit in clay for $1056. "A" frames can be purchased separately or with a two seat or three seat swing. Two seat casual back swing is $573 assembled in our delivery area, or $513 shipped direct to you in a box and you assemble it. A three seat swing in any of the regular colors with a "casual back"is $690 assembled in our delivery area, or $624 shipped direct to you in a box and you assemble it. Shown above is the two seat cozi back swing $721 assembled in our delivery area, or $661 shipped direct to you in a box and you assemble it. We also have a 2-seat swing in the comfo back option, price is the same as the cozi back. If you choose a natural finish color swing, add 10%. Add a roof to our "A" frame for total shade and protection from the rain, sun, etc. Available in all 8 regular colors $1050 fully assembled, in our delivery area; shipped direct to you $950 as a kit. 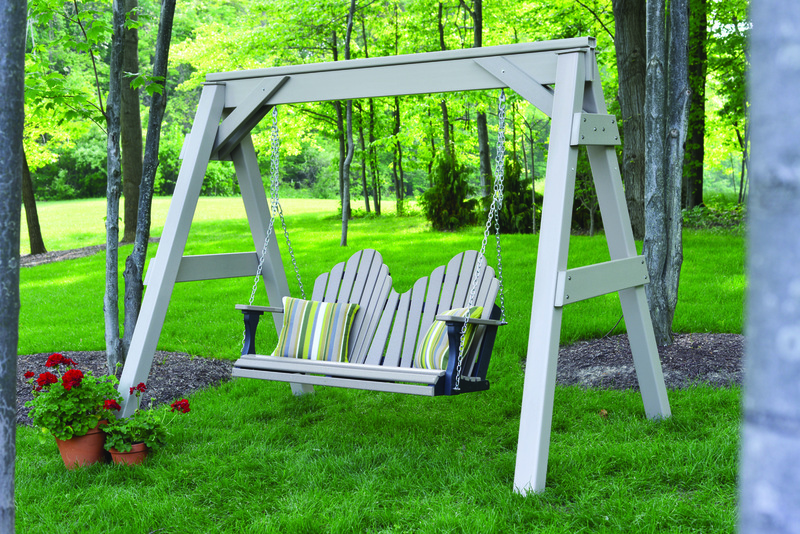 Picture as shown above complete with A-frame in clay, roof and 2 seat swing is $3077.